For those who are just now hearing about fibromyalgia, this is not by any means a new disease. However, it has been getting more and more attention lately. Why? Due to the number of people that are being diagnosed with this. It is becoming something that is more common than people realize. In fact, many people wonder if other illnesses that mimic the signs of fibromyalgia were often misdiagnosed in years past. Due to the popularity of this illness and so many people interested in how this can be treated, there have been several studies performed to see what works and what does not. However, it is important to remember that treatment for those with fibromyalgia is really up to the person. What works for one person may not work for another, thus finding treatments is really trial and error for most people. A new treatment hope for many fibromyalgia patients is Oxygen Chamber Therapy. This is a therapy that has been around for some time. In fact, if you were to read about this online you would find that many people state that this is the cure all for many ailments including cancer, diabetes and the like. However, many medical professionals warn that this is a therapy that is still in its beginning states of being tested for what it really does accomplish for a person. Originally this was a therapy designed for those who scuba dive routinely. Many of those who do this often suffer with decompression sickness. With this therapy, the person can gain back the oxygen levels that they need in order to feel better. 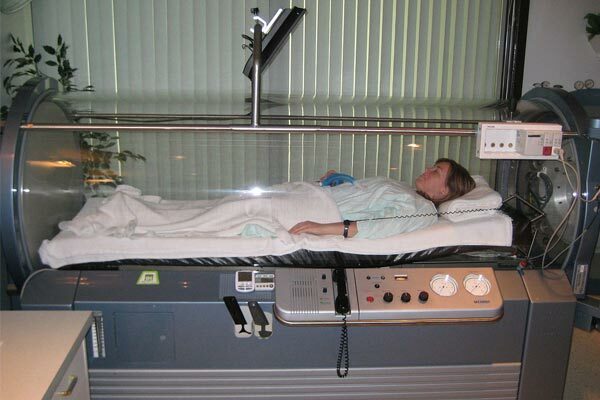 When a person is placed into a hyperbaric oxygen therapy chamber, the air pressure is increased to three times the normal air pressure. With these types of conditions, the lungs are able to take in more oxygen than you can on your own. For those who are taking in more oxygen, this helps the blood to carry even more oxygen to the organs throughout the body, while also helping to fight bacteria and to stimulate the released of growth factors and stem cells. It is with this process that healing is promoted. Are there Risks with this Therapy? Due to many people being told that this therapy could help them, they often wonder about the risks that they could be facing if they were to get this therapy. The good news is that this is considered generally safe for those who use it. However, people should rest assure that most doctors are going to be monitored their progress and can stop the pressure when they feel that it becomes too much. For those who finish this treatment, they may find that they are extremely tired or even extremely hungry after they finish. However, this is normal and should not impact normal activities at all. It should be noted that the FDA does not consider this therapy one that is ok to use for fibromyalgia. Now that you understand more of what this type of therapy is, how does it help those patients with fibromyalgia? To understand this, you must look at the studies that have been done. Probably the most appealing study utilized only women. Women are more likely to be plagued by fibromyalgia when compared to men, hence many of these studies are going to focus solely on women. The first group received no oxygen chamber therapy at all, and simply stuck to the regiment that they had been on for the past two years. The other women were given 40 oxygen chamber treatments over the course of two months. They were given these 5 times per week, with each session lasting 90 minutes. Those patients who were treated were given 100 percent oxygen at twice the normal air pressure limit and was administered this in cylindrical chambers. Once the women were done with these treatments, the majority of them no longer had the pain and tenderness that they once felt. This is a huge win for the fibromyalgia world! And better yet, the study took those women that received no treatment and provided them with the treatment as well. The results were just as good! The study commented that those women who did undertake this treatment did find that they were able to get away from their pain medications or to at least decrease the use of these. This is amazing news, as most fibromyalgia patients find the amount of prescriptions they take to be one of their main issues! People that also participated in the study reported less overall fatigue as well. Which makes sense, as most people have determined that it is the constant state of pain that makes you feel extremely fatigued. While this new therapy has not been FDA approved for the treatment of fibromyalgia, most people are hopeful. The initial studies of this therapy on those with fibromyalgia is proving to rather promising. For those who do suffer with fibromyalgia it could mean that they have a treatment option that could render results in a few short months. Results that are so promising that they may feel as though they never had fibromyalgia.